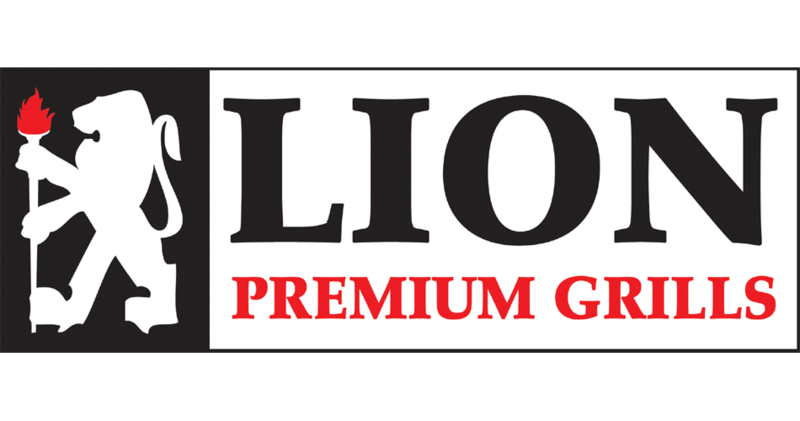 Hello from all of us at Lion Premium Grills! We’d like to welcome you to the 61st issue of our monthly newsletter. October has finally arrived which seems absolutely incredible that we’ve already entered the autumn months of 2018. Luckily that has zero impact on outdoor grilling and as far as we are concerned there is literally no better time for grilling than right now; the weather is cooling down and the Fall season is always a beautiful time of year. BBQ never goes out of season! We take pride in the quality of the goods we produce, our reputation, and our ability to provide the best customer service around. This issue looks at the variety of ways that you can maximize your grilling experience by upgrading, adding new accessories to your arsenal or even just integrating cooking tips into your skillset. We hope you enjoy this issue and we thank you for your continued interest and support! Enjoy! We have quite a bit of content lined up for you this month. Starting things off we have a delicious grilled garlic shrimp recipe that is really easy to make as well. If you like seafood this dish is perfect. 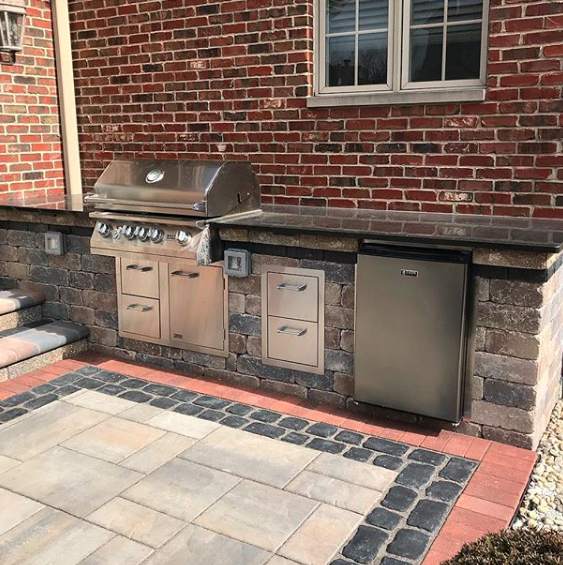 We also have a product showcase for our warming drawer which we just released last year; it’s an incredible addition to any outdoor kitchen or bbq island. 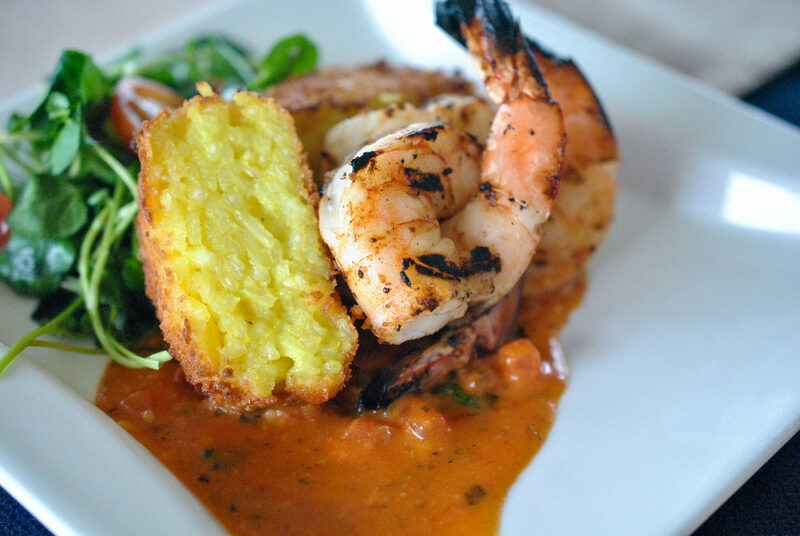 We also have a great breakdown of a glowing review we received from Texas Style Cuisine. Capping things off, we discuss the difference between using direct and indirect heat when grilling. Thank you for visiting us, we hope you find this month’s issue informative as well as entertaining. Thank you again! For our October 2018 edition we have another fantastic grilled seafood recipe. We are going to shine a spotlight on a dish that is absolutely amazing as well as being quite easy to prepare. This lemon butter grilled shrimp recipe comes from famed chef, tv personality, and restauranteur Bobby Flay. Check out the recipe below for instructions. Put the shrimp in a large baking dish. Combine the canola oil, garlic, red pepper flakes and fennel seed in a small food processor and process until the garlic is somewhat paste-like. Pour this mixture over the shrimp and let them marinate for 30 minutes. 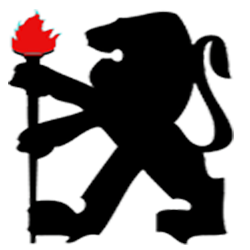 Light your Lion grill to high heat. Strain the shrimp from the marinade and season them with salt and black pepper, to taste. Grill the shrimp on both sides until they are slightly charred and just cooked through, about 2 minutes per side. (Chef’s note: They can be left slightly undercooked since they will cook longer in the butter sauce.) Transfer the shrimp to a plate. Melt the butter in a large saute pan set over the grates of the grill. Add the lemon zest, lemon juice, tarragon and thyme leaves and cook for 30 seconds. Add the shrimp and cook, tossing once, about 1 minute. Finish with the parsley and adjust the seasonings, if necessary. Transfer the shrimp to a serving platter and garnish with thyme and parsley. Our warming drawer houses a multitude of individual warming tray compartments that allow you to heat a variety of different items simultaneously. We rarely add new products to our line, but when we do it needs to actually stand out in terms of functional ability, visual appeal, and build quality. We feel the warming drawer checks all of those boxes and more. Read below to learn more! 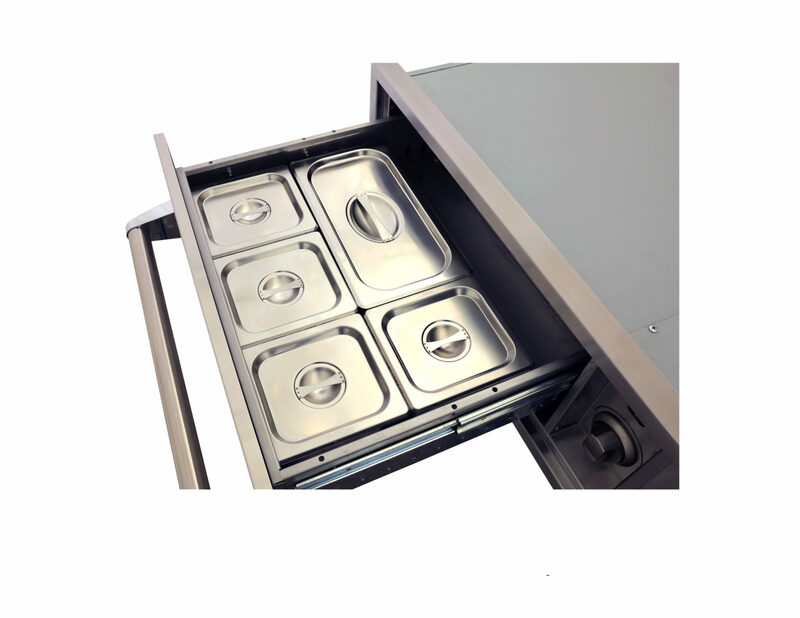 We use only high grade stainless steel for our products and our warming drawer is no different; it is constructed from 16 gauge 304 grade stainless steel. This grade and gauge of stainless steel is know for the heaviness and weight it possesses as well as being rust resistant and able to withstand environmental elements better than other grades of stainless steel. Other lighter grades of stainless are prone to bending, denting, rusting, and corroding. We do not compromise on the construction of our products and we will only use high grade, 16 gauge 304 grade. You will be able to immediately tell by the heavy duty feel that our warming drawer has. Our warming drawer is loaded with details and various features which we’ll make note of. 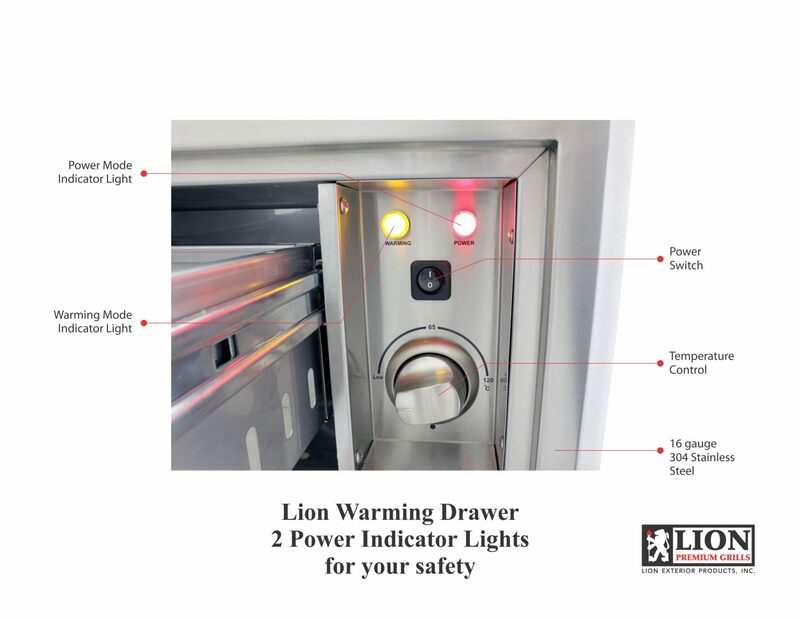 As you can see in the pictures above, our drawer has both a Power indicator (this indicator glows red to notify the user that the unit is indeed on) and a Heating indicator (this button glows yellow) that allows the user to quickly and easily see that the unit is actually warming/heating. Below the lights on the front panel you’ll be able to easily locate the power switch and variable temperature control knob that allows you to adjust the temperature of the unit to the desired level of heat. The front panel has small vents for moisture control as well. 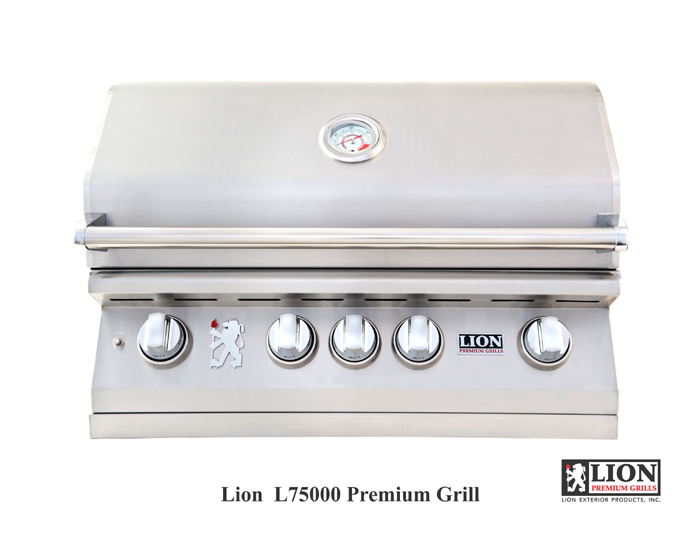 The unit also features a polished stainless steel handle and as with all of our line of products, an embossed Lion logo on the face of the warming drawer. It adds to the sleek visual design of the unit itself. Opening the drawer reveals five removable stainless steel food warmer buffet pans, complete with lids. As you can see in the image, there are four smaller pans and one large buffet tray. This is one feature that we can not stress enough — the ability to heat and/or warm a variety of different food items, sauces, etc. simultaneously. If you intend to host events, parties, family gatherings, etc. on a consistent basis, our warming drawer will dramatically increase the ability to multi task all from your outdoor grilling hub. 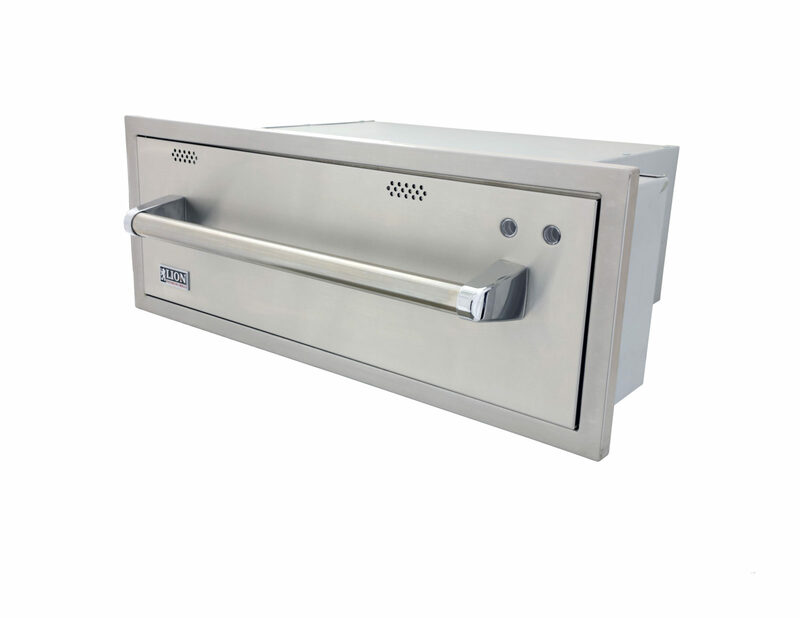 Our Lion Premium Grills Warming Drawer is CSA certified by the CSA Group. What does this mean exactly? CSA certification marks are used to indicate that a product has been rigorously tested to meet the high safety standards established by the CSA Group. In the United States the CSA Group is accredited by OSHA (Occupational Safety and Health Administration) and in Canada the CSA Group is accredited by the SCC (Standards Council of Canada). Certification marks are useful to consumers because they mean that the products tested meet the standards maintained by CSA, providing an assurance to the purchaser that the products meet these increased demands for quality control and safety. In this instance, safety is of the utmost importance for everyone involved. CSA marks are intended to provide peace of mind to retailers, consumers, and end users that the products in question — in this case our premium warming drawer — have been independently tested to meet the required safety standards demanded. The CSA Certified marks indicate quality and safety and we are proud to maintain these high standards set. Lion Premium Grills – Review from Texas Style Cuisine! 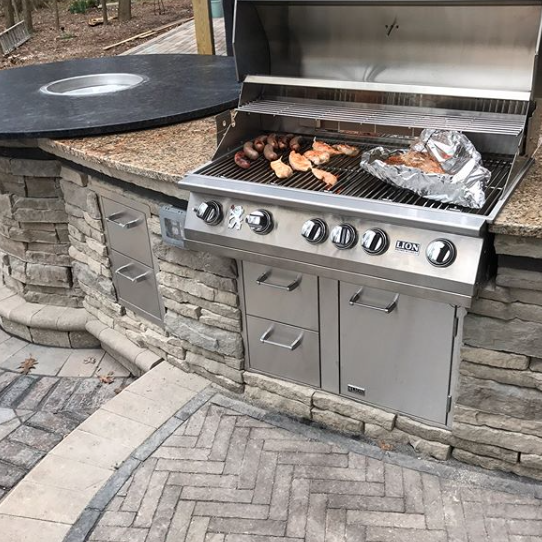 We have to extend our thanks to Chef Johnny Stewart of Texas Style Cuisine for recently creating such an informative and thorough review of our 32″ L75000 grill. Chef Stewart is an expert in grilling and is also the recipient of a multitude of cooking awards. We appreciate the high marks from someone so schooled in the art of BBQ. Let’s touch on some of the features that stood out in this review. The L75000 is crafted from 16 gauge 304 grade stainless steel; this type of stainless steel is premium grade, top of the line stainless steel. What does this mean? 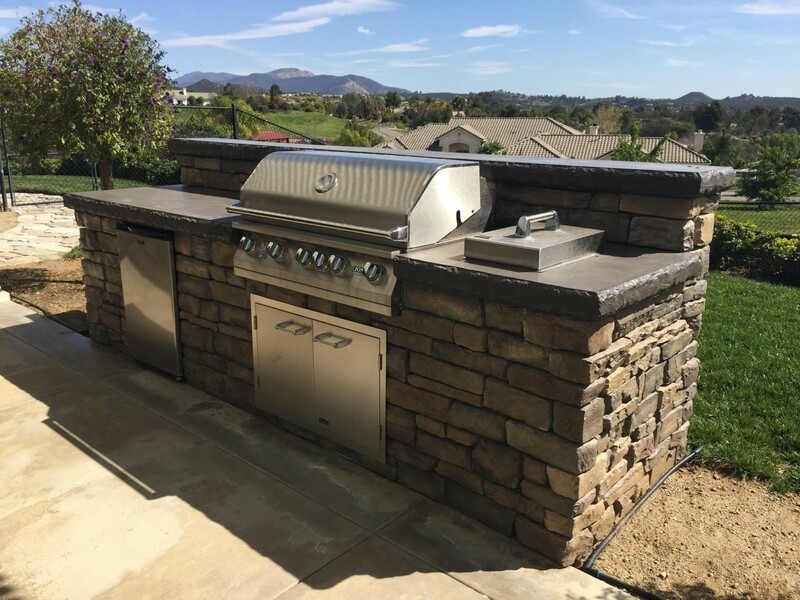 It means that our grill is built to not only maximize the durability and stability of the grill, but it is also rust resistant. Our grill, with some proper care, will be able to withstand elements that will make many other grills on the market corrode and rust. If you live by any body of salt water, rust can be a constant problem; our grill will withstand that and more. Another major plus mentioned in the review was the fact that our grill packs a major punch when it comes to grilling power and heat generation. Our cast stainless burners — which feature a lifetime warranty — output 15,000 BTUs each. Our infrared backburner generates another 15,000 BTUs for a total of 75,000 total BTUs for the 32″ 4 burner grill. If you need to really hit high temperatures our grill can achieve that without a hitch; it can also work wonders at low temps when your grilling requires a touch of subtlety. If you need even more power, you can always add an additional searing burner that will allow you to create the perfect seared crust of any premium cut of meat. Simply put, our grill is the total package. 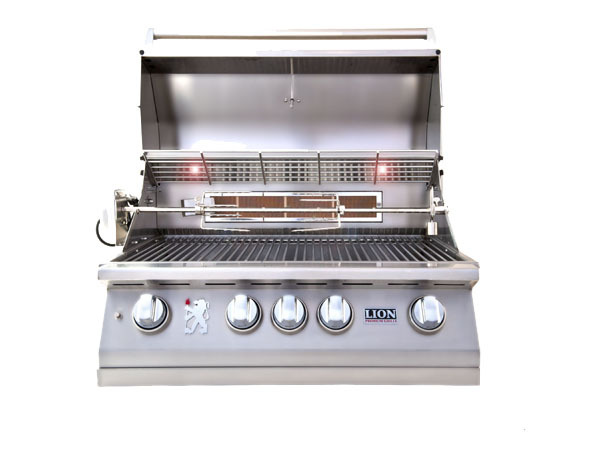 As Johnny Stewart said multiple times in the review, this grill is “built tough.” It’s heavy duty, it’s created with the highest quality of stainless steel. The cast stainless burners will last a lifetime. 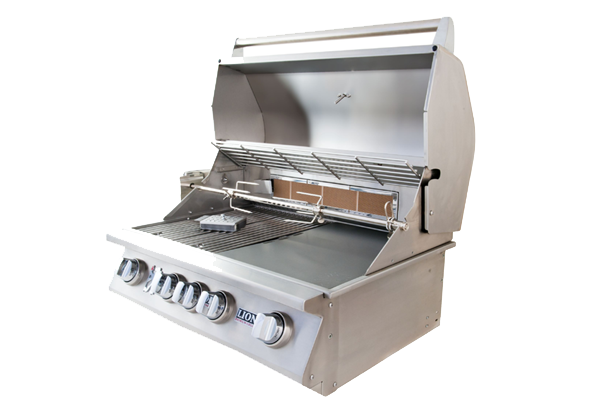 The grill generates a substantial amount of heat and can sear with the best of them. It also comes loaded with extras — a rotisserie kit, a smoker box, a griddle plate, and a grill head cover. On top of that, the grill looks undeniably sharp; it really pops visually, especially when seen in person. We love to feature some useful tips about grilling methods and this month we’re going to quickly look at the primary methods of cooking using your Lion grill; being able to properly utilize both methods will greatly enhance your grilling technique and the quality of your food. Most people that have used a grill are familiar with direct grilling which is the best method to utilize when cooking steaks, fish, etc. Indirect grilling is a bit different but if you plan on cooking prime rib, roasts, etc. this method is a necessity. We have a short overview but it should provide a nice starter guide for each of these methods. Cooking with direct heat is your basic grilling method that most individuals are familiar with; it is simply cooking your food directly over the fire. You should primarily cook with direct heat with the grill lid closed preferably, but it is possible to also use direct heat while leaving the lid up. Leaving the lid up will allow the food to cook thoroughly on only one side; closing the lid will allow a more even distribution of heat. Foods that benefit from high heat and are best with a nice sear on the exterior (steaks, burgers, etc.) are the best when utilizing this method. When you grill using in-direct heat you are basically cooking with the fire located on one side of the grill with the food being located on the other side. You are not using a flame directly to cook your food; instead, once the lid is shut, you are using radiant heat to cook. This will extend the length of time to cook your food, but it will also allow your food to cook more evenly and prevent any burning or scorching. Large poultry and roasts are best when using in-direct grilling.